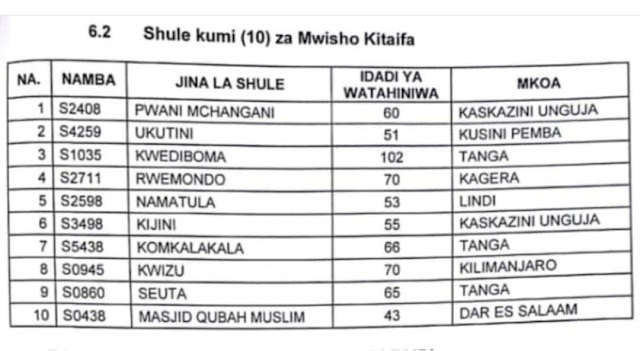 The Tanzania Examination Council (Necta) announced the results of the Fourth Form in 2018, mentioning 10 schools that were successful in the test for more than 40 schools. In the result, a well-educated student is from Arusha's Ilboru High School, named Hope Mwaibanje. However, Necta has said the rate of achievement in the fourth quarter, has risen by 1.29 percent, from 77.09 percent in 2017 to 78.38 percent in 2018. Announcing the results today on Thursday, January 24, 2019 in Dodoma, the Secretary-General of the Council, Dr. Charles Msonde has named them St Francis Girls (Mbeya), Kemebos (Kagera), Marian Boys, Ahmes, Marian Girls (both on the Coast), Canossa, Bright Future Girls (Dar es Salaam), Seminar Seminar (Kilimanjaro), Precious Blood (Arusha) and Bethel Sabs Girls (Iringa). He said they were awarded nine of the top 10 girls in the world, with the result of St. Francis's School of Mbeya, the 10th most beautiful girl from the Anwarite Girl in Kilimanjaro. As a result, 252 applicants have been disadvantaged by fraud and among them, 71 are independent while two of them are insulting.